The proven QED framework is complemented with clear acrylic shelves to create our extensive range of brochure display units. The options are endless, colour, wall mounted, counter top or free standing, single or double sided display units. If required the shelves can have divisions of any size to keep brochures neatly separated. Choose from one of our standard brochure holder designs or we can custom design a brochure holder unit to suit your specific needs. The illustration below shows a free standing single sided with sign at top. 770mm wide x1700mm high. Range of sizes available – typically 300mm to 1200mm wide with 1 to 5 shelves available. The photo shows a free standing single sided display unit at 770mm wide x 1550mm high. The illustration below shows a wall mounted display unit. 770mm wide x 1250mm high. Range of sizes available – typically 300mm to 1200mm wide with 1 to 5 shelves available. Can be supplied with or without sign at top. 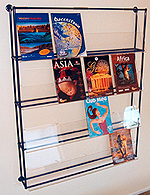 The photo below shows a wall mounted display unit at 1010mm wide x 1250mm high. 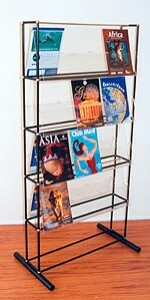 The illustration below shows a wall mounted 50 DLE pocket display unit with sign at top. 1290mm wide x 930mm high. Range of sizes available – from 1 to 10 rows of between 1 and 10 DLE brochure. Can be supplied with or without sign at top. The photo below shows a wall mounted 50 DLE pocket display, 1290mm wide x 930mm high, with sign at top. 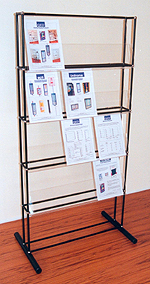 The illustration below shows a free standing double sided display unit. 300mm wide x 1550mm high. Range of sizes available – typically from 300mm high to 1200mm wide with 1 to 5 shelves per side. Can be supplied with or without sign at top. The photo below shows a free standing double sided display unit at 770mm wide x 1550mm high. Illustration at right shows a free standing multi brochure display unit with sign at top. 800mm wide x 1750mm high. Range of sizes available – with or without sign at top.